If you like unique options when taking your baby out for a stroll, then listen to how this baby stroller seat works. It has a 360 degree view option. The seat allows you to rotate the child seat from parent-facing to forward- facing and then back again. There is no need to remove the seat when changing the view. The seat has a swiveling support bar with a removable snack tray. For comfort, the Orbit Baby G3 Stroller Seat is padded and has a reversible infant insert with cool mesh on one side and ultra-soft fleece on the other. The nice thing about this stroller seat is that you can protect your baby from the sun or wind by easily rotating the seat. Or, if you want to talk to your baby, just turn the seat around so you can look at each other eye to eye. Then if there is something to view like at the zoo, again simply swivel that baby around. For packing up your stroller, simply twist and lift with one-hand. The handlebars are adjustable by height. Included are built in cup holders. Please note that this stroller seat does not come with the stroller base. That will need to be purchased separately. As of this writing, the Orbit Baby G3 Stroller Seat had 46 reviews and 25 questions answered on Amazon. I've read the reviews and questions and condensed the results. I hope that this makes it easier for you to decide if The Orbit Baby G3 Stroller Seat is for you or not. "The Orbit baby product are High End and pricey. The construction is very well, using high materials in the seat and very unique in it's design. Once attached to the base unit, it operates really nicely as it swivels in both directions and sits up and reclines to a flat sleeping position. The big question is, is it worth what it cost? Like any product, if cost is not a factor, this Orbit is nice. When you push your baby around in an Orbit stroller, you will be recognized by the space age design and high quality construction." Keep in mind that you will need to purchase the stroller base separately. The base is even more expensive than the seat. So, if price is a factor then you may want to pass on by. However, if money is not a factor, then this is a pretty nifty stroller, mainly considering the 360 degree viewing factor. "So far my favorite feature is the reversible insert for both hot and cold weather as it has been 90+ here all week. I have had it on the cool side and when I pick up my daughter, no sweat ring! So I'm sure this is much more comfortable for her. I have the G2 stroller frame and as promised, this fits the base. A sun shade DOES NOT come with this stroller seat. It must be purchased separately." So this stroller seat is pretty cool. But, how easy is it to pack up and travel with in a car trunk or back seat? Will it even fit? Even though I'm reviewing only the stroller seat, I'll assume you will be buying the stroller base too. Here is what a mother said about the portability of this stroller, "The seat needs to be removed from the stroller in order to fold the stroller and get everything into your car. This is not a one person job in my opinion and I only like to use this stroller when my husband is around." This same mother went on to say, "This system takes up all of my trunk space. I drive a Chevy Volt (similar size to Prius). So keep that in mind if you don't have a lot of trunk space or space in your house. The way the stroller base and stroller seat stacks doesn't really work with the way I load and unload my car. I have to take the baby out of the stroller seat and strap her into the car seat. Then I remove the stroller seat and put it on the ground. Then I fold the stroller base and put it in the car." So in summary, this isn't an easy stroller to travel with. Perhaps, if you had a truck or van, it wouldn't be a problem. And for leaving from the home excursions it may just be perfect. But if you have a small trunk space and plan on traveling with this stroller seat, you might want to think twice. For more information on strollers, check out our Top Ten Double Stroller Reviews Of 2018. This is a high end stroller seat. It's going to cost a lot, but it is very unique. So if money is not a factor, you may enjoy the 360 degree swivel effect that this seat offers. The rotating seat was the main selling point for parents. The second feature that parents liked was the comfort level. Their children seemed to feel relaxed and comfy in this seat. However, a draw back in addition to the high price, is that it doesn't easily fold down for putting in a vehicle trunk space. Another draw back is that it does not come with the sunshade. Remember to keep in mind that the price mentioned above only includes the stroller seat, not the stroller seat and stroller. 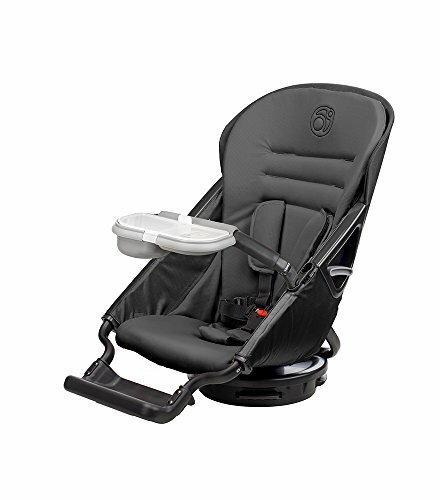 I hope that my review of the Orbit Baby G3 Stroller Seat helps you as you look to purchase a car seat. For even more information, check out our article, The Top 10 Baby Car Seats Of 2018.